September 23, 2016 – When astronauts in Orion venture far beyond Earth into deep space, they will expand humanity’s frontier and push the boundaries of exploration. While the spacecraft is designed with systems and materials to keep the crew safe during their journey, leaving the protection of Earth’s magnetosphere exposes astronauts to a radiation environment in space that scientists and engineers at Johnson Space Center in Houston are working hard to protect against. NASA works to protect astronauts from radiation and limit their exposure over time because chronic effects can, for example, include an increased risk of cancer. To limit risks in Orion, the team is developing a way to make use of the mass on board the spacecraft to protect the crew and recently conducted evaluations at Johnson to test procedures for getting astronauts into their protective environment as quickly as possible. If the warning were to sound, the crew would create the shelter within an hour and in some cases would need to stay inside for as long as 24 hours. 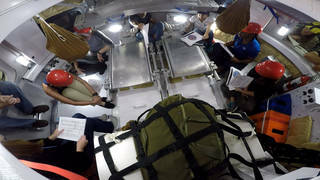 Using the stowage bags on board that will contain supplies, food and water, in combination with Orion’s seats will allow astronauts making the shelter to strategically place denser bags in areas of the vehicle with less radiation-protecting materials. For example, the bottom of Orion where the heat shield and service module are attached will provide more shielding than other areas, and stowage bags can be used for parts of the spacecraft’s interior with less shielding. The evaluation also included assessing ways to tie down the stowage bags, where to locate tubing to provide air to the shelter and the best ways to get in and out of it. After evaluating test results, NASA will further develop the procedures and conduct additional testing. Orion will launch atop NASA’s powerful Space Launch System rocket to deep space destinations on NASA’s journey to Mars. It’s first mission, Exploration Mission-1, will send an uncrewed Orion about 40,000 miles beyond the moon in late 2018.